Who could use a little help with spring cleaning? I hate cleaning the bathroom yet it’s the first room in the house that usually needs it the most so any help I can get I take it! Scrubbing Bubbles has a new bathroom toilet bowl cleanser that takes even the dirtiest job and makes it easier than ever before. With a stylish kit and easy-to-use and refill pads, Scrubbing Bubbles Fresh Brush is the perfect way to make toilet bowl cleaning, fast, effective and easier on anyone. It also comes is a decorative, stylish caddy that will match any bathroom motif. Be sure to check on this full review for more information on this product. Simply follow the Rafflecopter form below for your chance to enter and win. Giveaway is open to US Residents, ages 18+ years of age (Limited to one entrant per household). The Giveaway ends on 06/02/14. Being disabled I am going to use the automatic scrubbing shower cleaner. My favorite Scrubbing Bubbles cleaner is the Scrubbing Bubbles Bathroom Cleaner, Aerosol. I have used it on the kitchen floor for tough spots also! Great products! Actually I love the Antibacterial Bathroom Wipes for everyday little areas in between cleanings. My favorite is the Scrubbing Bubbles® Vanish® Continuous Clean Drop-Ins™. I like the Disinfectant Bathroom Cleaner. I like the shower power automatic cleaner. I really like the Scrubbing Bubbles bathroom cleaner. I love the Scrubbing Bubbles Bathroom Cleaner. It works wonders! My bathroom sparkles after I use it! Those bubbles know what they are doing!! I like the Toilet Gel Cleaner! I love the Scrubbing Bubbles Mega Shower Foamer . I have always liked their disinfectant spray cleaner for our bathroom. It works really well. I like the shower Cleaner! The foaming bathroom cleaner is my favorite Scrubbing Bubbles product. I really like the Shower Cleaner! I like the Antibacterial Bathroom Wipes. My fave is the bathroom cleaner….it makes cleaning the sink so much easier. I love the disinfecting spray. I have not tried anything else but I would love to. The foaming bathroom cleaner for sure!!! I really like the Scrubbing Bubbles Fresh Brush Starter Kit & Caddy. I actually have it in my bathroom right now! I love the toilet gels! I like the kitchen cleaner. The original bathroom foam cleaner. Always my first choice. The scrubbing bubbles bathroom cleaner and I use the gel toilet cleaner. I like the foaming bathroom spray cleaner. I like the Scrubbing Bubbles Antibacterial Bathroom Wipes. They make it easy to keep things clean on a daily basis and makes weekly cleaning a snap. My favorite is the Scrubbing Bubbles Bathroom cleaner. I love the Scrubbing Bubbles foaming bathroom cleaner. I also love the foaming bathroom cleaner. It cleans my bathroom really well! I like the foaming bathroom cleaner. It really cleans the soap scum from the tub. My favorite Dow product and all time bathroom cleaner is the scrubbing bubbles aerosol, it cleans showers like none other. My favorite is their Fresh Brush System. I threw out my yucky old toilet brush the moment I got one of the new kits! I like the Foaming Bathroom Cleaner. I love the Mega Shower Foamer with Ultra Cling Trigger. But all their products clean so well. I love the Disinfectant Scrubbing Bubbles Bathroom Cleaner! With four kids, I use it all the time! I like the antibacterial bathroom wipes! I like the Foaming Bathroom Cleaner the best & have always wanted to try the Foaming Shower Cleaner, thanks. I like the toilet bowl cleaner. No dirty brush, just toss the pad when you’re done. We’ve used the bathroom cleaner since I was a kid. I love how it smells! I have never used Scrubbing Bubbles but if I did I would use the Oxy Power Scrubbing Bubbles Grease and Stain Remover. I like the new changing color foam cleaner they have and the gel inserts for the toilet. I like their foaming bathroom cleaner, but would love to try the flushable toilet cleaner – not so messy! I always loved the Scrubbing Bubbles Automatic Shower Cleaner, but lately I can’t seem to find in the store, maybe I can find it online. I’ve always loved the scrubbing bubbles foaming bathroom cleaner. It really does work well on my shower walls. I have always used the bathroom foam cleaner. It has always worked for me for many years. The bathroom cleaner works great! i truely love the toilet bowl cleaning gel, i purchased it about a year ago on sale and wow i fell in love , thats what i use from scrubbing bubbles and its my favorite. I like the scrubbing bubbles foaming bathroom cleaner, I always use it. My favorite brand product is their Bleach 5-in-1 Scrubbing Bubbles® All Purpose Cleaner with fantastik. I like the Foaming Tub & Shower Cleaner. 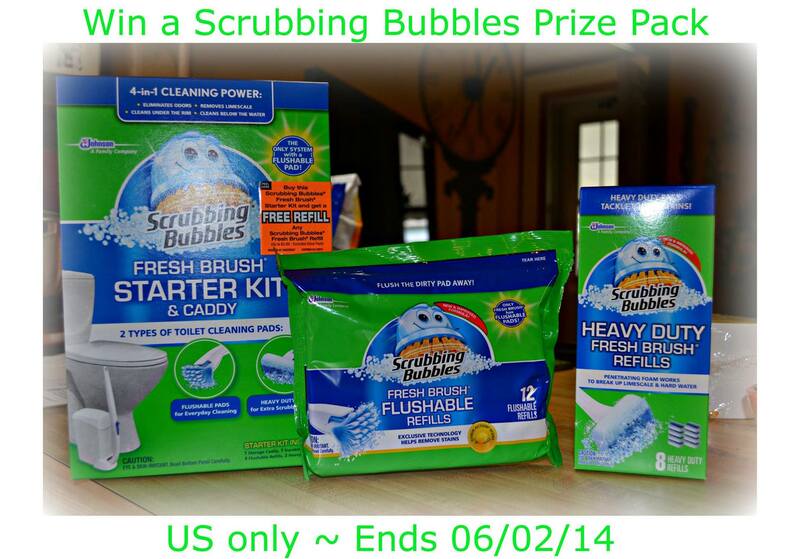 Scrubbing Bubbles Fresh Brush Starter Kit & Caddy! The tub and tile cleaner. IO would like to try the other products. I love their foaming bathroom cleaner! I love the Scrubbing Bubbles Bathroom Cleaner…it works really well! Thank you for the giveaway!! The disinfectant bathroom cleaner is my favorite. Bleach 5-in-1 Scrubbing Bubbles® All Purpose Cleaner with fantastik I would like to try. Scrubbing Bubbles All Purpose Kitchen Cleaner w/Fantastic. is my fave, thank you for this chance to win. I absolutely love the scrubbing bubbles bathroom cleaner works like a gem. I use the bathroom cleaner all the time and have forever. I love the heavy duty kitchen cleaner. My favorite product is Scrubbing Bubbles Mega Shower Foamer. I like the Scrubbing Bubbles Automatic Shower Cleaner. Nice not to have to scrub really hard when this product does a lot of the work for you! My favorite product is the Foaming Bleach Bathroom Cleaner, bleach so it gets the job done and foam so there’s less scrubbing for you to do! I love the Scrubbing Bubbles Mega Shower Foamer. I like the Starter kit. I like the bathroom cleaner with color power. Such a neat concept!